Deep Silver and Comcept have released the first official Mighty No. 9 gameplay trailer, showing the game's hero, Beck, in action against several of his fellow Mighty Numbers. "Beck" seems like kind of a dull name when compared to those of the other Mighty Numbers, doesn't it? Pyrogen, Cryosphere, Dynatron, Seismic, Battalion, Aviator, Brandish, Countershade... and Beck. He sounds like the Avengers' butler or something. But he is, in fact, the hero of the game, and so it is that Deep Silver also announced today an "extremely limited" collector's edition that will include individually-numbered Beck statues that stand 6.5 inches in height, with 14 points of articulation and three swappable faceplates. The Mighty No. 9 CE will come in a special package emblazoned with a foil signature from creator Keiji Inafune, and will sell for $60. Mighty No. 9 comes out in the Americas on September 15, and the rest of the world on September 18. 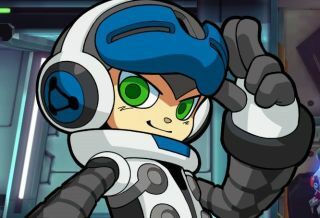 More information is up at MightyNo9.com.